This blog tries to stay out of Middle Eastern Politics and focus on Hummus - but sadly - sometimes an event occurs that forces even neutral bloggers to express their opinions about events. The Israeli consulate of Beverly Hills, the Bait Israeli and the IAC ( Israeli American community) just launched their first Israeli Hummus festival in Beverly Hills. The event will take place outside Beverly Hills city hall - which makes it even more symbolic.
" Join the IAC, Bait Israeli, and the Israeli Consulate for the the First Annual Hummus Festival! The Festival will feature a smorgasbord of hummus from various vendors, fresh pita, a Judiaca booth, activities for the children and live music in both Hebrew and English! Come early to get your hands on all the fare!" So why is an event celebrating Hummus being criticized by a blog dedicated to Hummus lovers of the world? Perhaps there is nothing wrong with the Israeli community celebrating a food dish most Israelis love and cherish. It's probably a great opportunity to promote various Israeli restaurants in Los Angeles and their own Hummus dishes. That said, in LA, most of the best Hummus restaurants based on our own personal experience have always been Arab restaurants. The Hummus festival should not have been marketed as an Israeli Hummus festival but rather as the Beverly Hills Hummus festival. 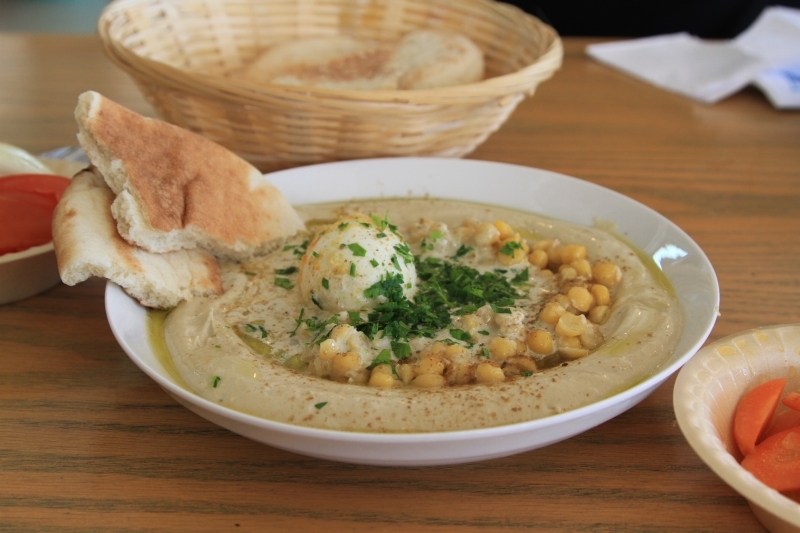 Hummus is a dish loved by everyone - and brings much pride to both Arabs and Israelis. Unlike the real estate conflict between Palestinians and Israelis in the middle east - a conflict that unlike the media noise about it - at it's base is a conflict focused on a land dispute - i.e. REAL ESTATE. There is no conflict between Israelis and Arabs living in Beverly Hills, Los Angeles, Orange County, San Fernando Valley etc. Former Israeli and Arab country residents now residing in the US might have opposing opinions about the solution to the Israeli Palestinian conflict in the middle east - but in the US - their legal country of resident there is no US based real estate conflict. That is why, I feel the Israeli consulate erred in being a partner to this event. So did the city of Beverly Hills that approved of this event outside their city hall. The event should have been called The first Beverly Hills Hummus Festival - without having it belonging to any one nation or it could have been the Middle Eastern Hummus Festival and have all middle eastern restaurants be part of it. Many Israelis are Hummus connoisseurs and so when it comes to Hummus they don't care who makes it as long as it has a great taste. In Israel - the best Hummus restaurants, in many people's opinions are owned by Arabs and are located in Arab villages not in the big Jewish cities. Also, some of the best Hummus is made by Palestinians and some are even in contentious areas like east Jerusalem. People who love hummus know that sometimes one has to put politics aside and just focus on the taste and choose where to eat based on taste not the opinions of the creator of the hummus. Many Israelis living in Los Angeles love going to the Arab restaurants in LA for the great Hummus they serve. That said - do we really care about the politics of the owner of the Thai restaurant we love? the Indian restaurant we love? The Italian restaurant we love? Perhaps the idea of creating an Israeli Hummus festival - is to hint to members of the LA Jewish community it's a Kosher event with Kosher Hummus. That's OK but then they should have labeled it for what it is. A KOSHER Jewish Hummus festival rather than an Israeli Hummus festival. Even in Israel - not all Israeli restaurants are Kosher. Some are certified as Halal - which obey the Islamic laws - and some Israeli restaurants go by no religious laws and only obey the country's health laws. Moreover - what does Israeli Hummus festival actually mean ? The Hummus is made by local restaurants here. They are called Israeli - perhaps because the owner might be Israeli - but the food is actually middle eastern in most cases. Saying Israeli Hummus is like saying American Pad thai, American Alu Gobi, American Spaghetti. While Americans love Pad Thai, Alu Gobi and Spaghetti they aren't American dishes even if they are served in an "American restaurants" - Hopefully, there is no hard feeling by anyone in the US for calling Pad Thai a Thai dish, Alu Gobi an Indian dish and Spaghetti an Italian dish. Consulates always want to promote events that promote their country and so I understand why someone at the consulate approved of promoting an Israeli Hummus festival. I feel for most of us - words still mean something - and words can hide behind them a lot of things - including racism and hatred. The Beverly Hills Farmer's market which is hosting this event could have gotten probably the same amount of response and maybe even more if they labeled this the first Hummus Festival and underneath add in the paragraph describing this event- Kosher Hummus, Halal Hummus, yes and even claim there is an authentic Israeli Hummus - which I have no clue how it tastes different than an Arab or middle eastern hummus. They could have still added fun for the whole family including Israeli music etc..This way they would not have alienated anyone and made it into an event for all middle easterners who love hummus - regardless if they are former Israelis, Lebanese, Syrians, Egyptians, Persians and all other Middle eastern Hummus lovers. Hummus must continue to be a tasty dish that unites all middle easterners and not something that seperates them just like other issues seperate them. I hope those of you reading this will not think I am biased against any political view. This isn't about what the solution to the conflict should be. This is merely about how we not politicize Hummus. Here's a link to the event. If you feel like it - let the organizers know that Hummus festivals must unite people and not be something that is separates members of the middle eastern family.